The SPSP consists of the subscribers to its mailing list, which consists of news items of interest to... SPSP members. Anyone who's subscribed is a member, and anyone is free to subscribe. The SPSP list is for announcements, not discussions: Calls for papers or applications, open job opportunities, conference announcements, ... .
Will subscribing cause a blizzard of emails in your inbox? No. 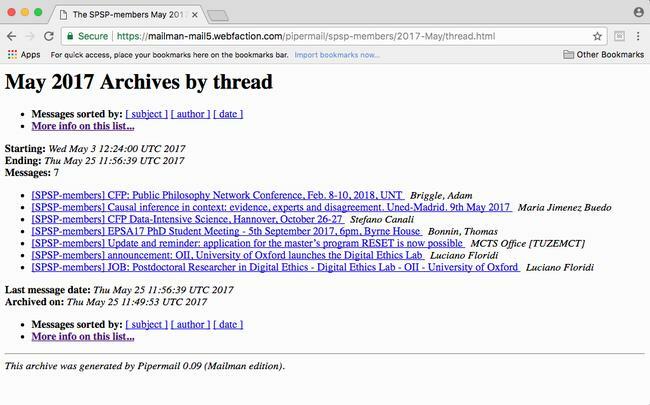 A fairly typical month was e.g., May 2017 : There were seven messages (three on May 3rd, four later in the month), including two conferences' CfP, a workshop announcement, an available masters course as well as a postdoc position; these were announcements from Texas, Madrid, Exeter, Hannover, Munich and Oxford. In more precise numbers: The two-year period 1 September 2015 – 31 August 2017 saw 183 messages over 729 days, which is 7.6 per month on average; there were 11 days with three messages, 14 days with two messages, 122 days with a single message, and the remaining 582 without any. Please note that only members can post to this list; if you are not a member, the autoresponder will let you know that the message will be ignored. If you are a member, your message will be reviewed by the mailing list moderators and (if appropriate) sent to all subscribers. Simply fill out the registration form! In that case, you'll also be removed from the members list (if you chose to be listed). This deletion from the list will not happen if you stop receiving emails because (a) you set your email client to actively block them, (b) your account is deleted, e.g., after leaving your institute, or (c) your client filters them out, hiding them from you. Note that in the first two cases [=a,b] Mailman will automatically unsubscribe you, in the last [=c] not. If you want to look through the list messages, go to the archive and search by thread.